Slimmy’s 'open access design' simultaneously allows for slimness and ease of access. It’s so intuitive and self evident; this is the way a slim front pocket wallet should be. 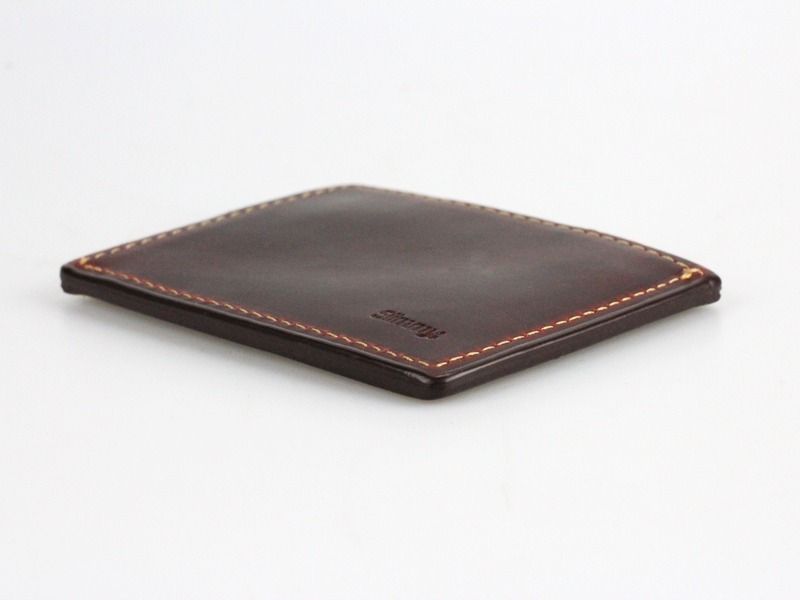 We can’t emphasize enough that, in the slim wallet category, we truly are the slimmest of slim leather wallets. However, the unique proposition we bring to the slim leather wallet world is the open access design of the Slimmy. Ease of access is fluid. There is no folding or unfolding necessary. And with the visual that comes along with our patented design, you get an often overlooked benefit (irritation), which we will discuss shortly. Let’s start with the the open pocket design. We think it's genius and a key reason why the Slimmy is the slimmest leather wallet on the planet (4mm). One true advantage of the open pocket design is the easy flow and exchange of its contents. Alter your mindset for a moment to understand the philosophy behind the Slimmy design as being akin to a river in nature. The river is powerful when it is unobstructed and is allowed to flow. Like a river, the open pocket design allows for this minimal wallet to effortlessly circulate your in-wallet carry as you go about your journeys into the world. Perhaps your just heading around the corner store to buy couple items. You grab your Slimmy with pease of mind that your automatic EDC (ID, cash, debit, credit and business cards) is ready to go, with a little room to spare for change or receipts. The open access design allows for expansion should you need it. You’re all set for the jaunt down to the convenient store. Easy in, easy out. Let’s say you get back and you have a companion or two beckoning you out for dinner, and perhaps a drink or two at the club afterwards. It’s Friday night. You look at your Slimmy as you put it into your pocket and notice that it is getting a little unruly. Immediately you purge what you don’t need (receipts, a debit/credit card or two), making room to store your Slimmy in your front pocket with your smart phone. Easy flow, your carry is down to what you need. You are ready for the evening without front pocket overload. Importantly, Slimmy is designed to create both physical and visual irritation, so the idea of overstuffing it is unbearable. With the open access construct, Slimmy reminds you to purge immediately. 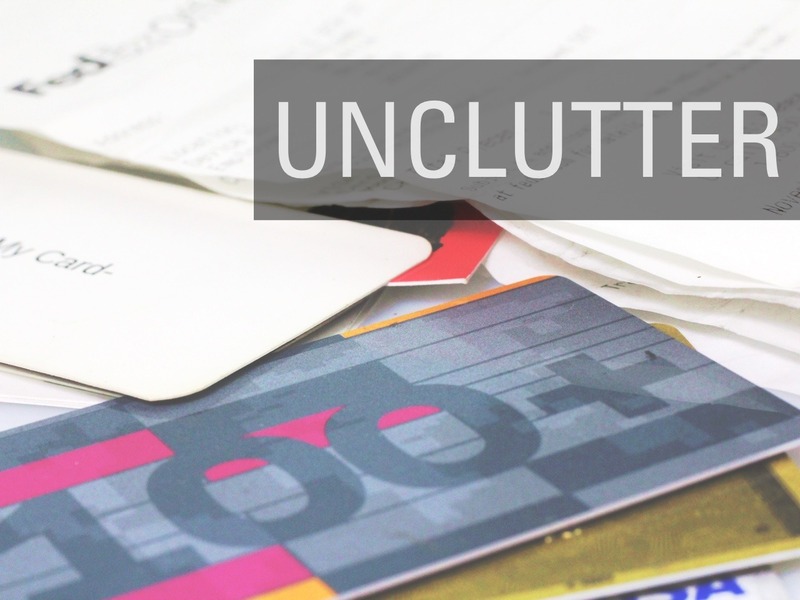 Unlike a billfold or trifold you can actually see what you accumulate, which is a visual nudge for you to unclutter before it gets out of hand. As the saying goes, 'out of site, out of mind.' This is one of the reasons billfold and trifold wallets grow and grow because you cannot see what it is in them. And the bigger they get (unlike a Slimmy, they tend to offer way more room than you need), the less likely you will want to deal with purging them. If this were not the case, why are there so many big fat wallets in the world? Upon inspecting our competitors, we noticed that other designs are not nearly as fluid. Or tasteful. Or honest. Or irritating. 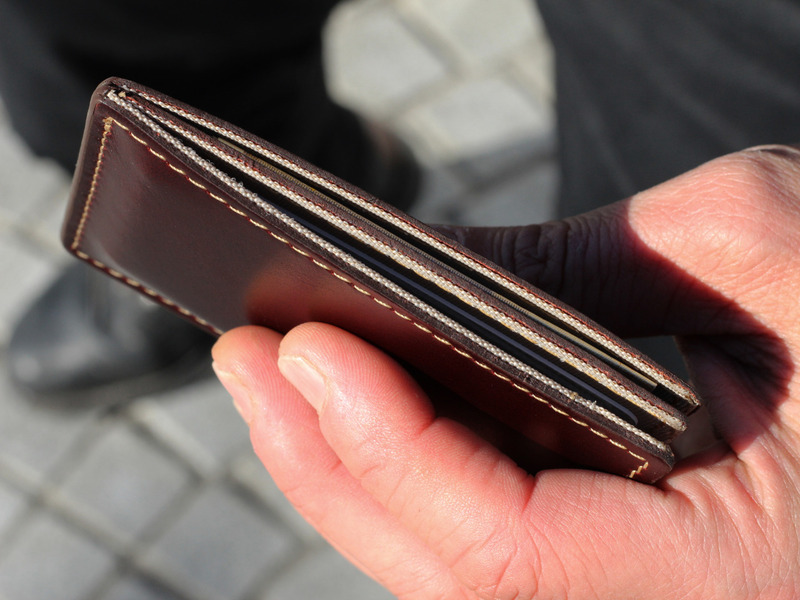 For example, almost all leather wallets claiming to be thin are simply too thick before putting anything into them. In some cases they are a full 1” (25mm) thick empty! This is especially true with folding wallets. 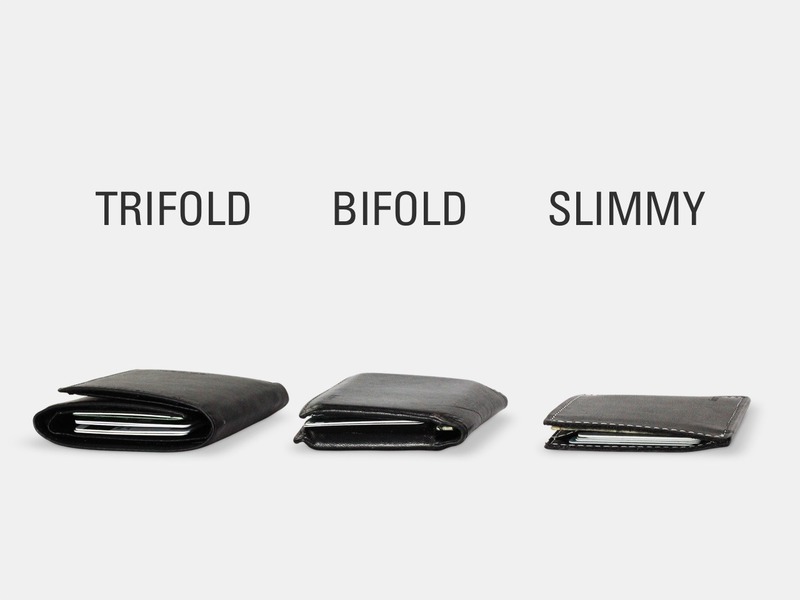 The bottom line is that there is no way a bifold or trifold wallet should ever be in the slim wallet category as folded leather creates a lot of bulk. 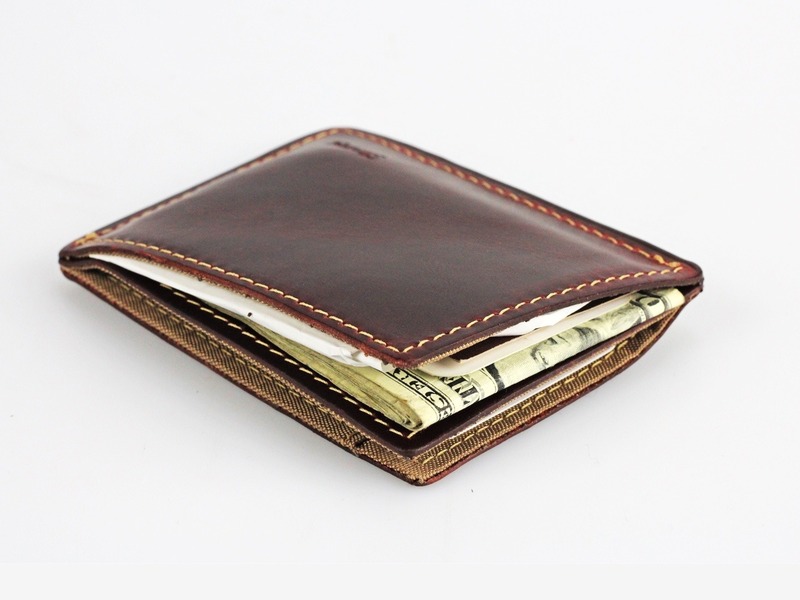 Other slim wallets also feature a stacked slot design, which results in added bulk. Too tight or stacked in an odd way, they can be considered anything but easy access. Overall, these designs just came across as awkward to us. We don’t point these design flaws out to demean our competition. Quite the contrary, we respect them. However, we want to create an awareness amongst minimalists and slim leather wallet enthusiasts for what to look for when purchasing a slim leather wallet. Many people are not ready for the Slimmy (and the irritation it may cause). For those that are ready to pursue a more minimalist lifestyle, Slimmy forces you to purge and focus on what is necessary. Eliminate more. Eliminate confusion and disorder. Unclutter. Untether. Less is more. 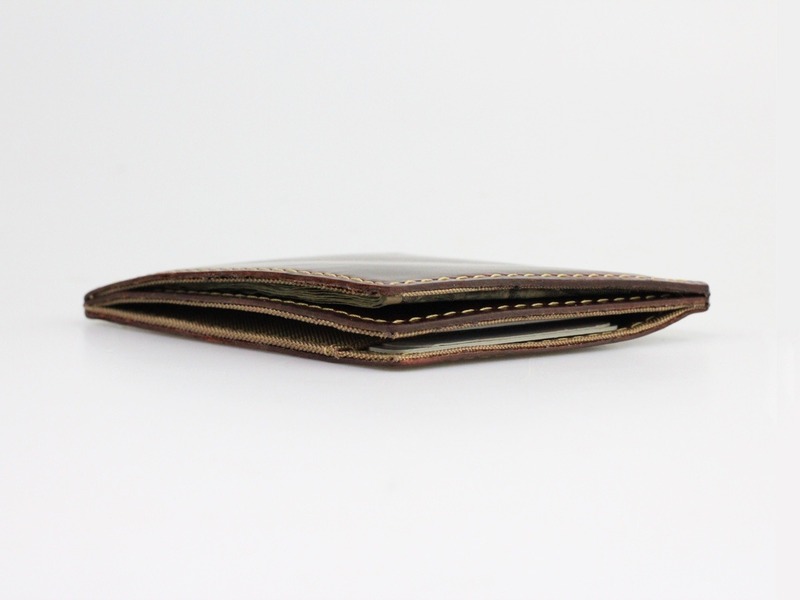 The wallet featured in this post is the Slimmy X2S2 Oil Tan. X1 Slimmy 2: Crossing Borders, Breaking Boundaries.